In this quote Bill Gates was talking about the last major transition that occurred in the technology industry. The emergence of the personal computer during the 80’s and early 90’s sunk many early technology companies and almost toppled even IBM. Bill Gates recognized that no matter how big a company is, a significant shift in technology can undermine a business model almost overnight. This was one of the reasons that under Bill Gates, Microsoft was merciless to their competitors and almost as merciless to their own strategic partners. Bill Gates saw nearly everything as a threat and he was not going to let an up-and-coming new technology do to Microsoft what the personal computer did to IBM. Fast forward to today and we see that Bill Gates’s prophecy is holding true. Microsoft, as many other Old World technology companies, are struggling to find relevancy in The New World of Technology led by companies such as Apple, Google, and Facebook. Once dominant, Microsoft and their OEM partners settled for complacency in the PC market while companies began to grow empires in the new markets of Internet, social media, and digital media players. For many technology companies such as RIM (BlackBerry), the knockout came with the one-two combination of the iPhone and iPad. For Microsoft, they’ve been knocked down, but the question is can they get back up. And if they do manage to get back up, will they ever resemble the dominant company they once were? It’s no secret that Microsoft’s future hinges on how well they execute their launch of Windows 8. Windows 8 is the lynchpin of Microsoft’s strategy to recapture the title of the world’s leading technology company. Microsoft’s plan is pretty simple. They want to bring a new and unified Windows interface to PCs, laptops, tablets, and smartphones. By doing this, Microsoft believes they can leverage their dominance of the PC market to jump-start their entry into the mobile market. They believe Windows 8 will be the bridge between the Old World and the New World of Technology. On the surface, this sounds like a fair plan. Many people are familiar with the Windows operating system so it could follow that they’d like to extend that familiarity to their other devices as well. However, Microsoft’s entire plan revolves around a key assumption. It is this assumption that ultimately will doom Microsoft’s strategy and possibly the company itself. The vast majority of PC purchases are made by large companies. Enormous volumes of purchases are controlled by a relatively few people in IT departments. Large numbers of people who ultimately use the computers generally didn’t have a say in the purchase decision. Until recently, most people based their individual technology purchasing decisions upon what they used at work or were recommended by their IT departments. The early history of the PC market was marked by compatibility issues. It was difficult to share data or software between different computing systems, entrenching many users into the Windows platform over several purchase cycles. Smartphones and tablets have expanded the definition of what people consider “computers”. Sales of these mobile devices have definitively impacted the PC market. Society is much more tech-savvy now. Consumers are no longer relying on IT departments for their information, are now making their own purchase decisions, and are increasingly buying non-Microsoft devices. Compatibility issues are much less prevalent now, removing the long-standing hurdle to using non-Windows platforms. The predominant force in the technology industry is now the Internet. Even with all the above points, the biggest issue working against Windows is the very familiarity that Microsoft thinks is an asset. Yes, most people have years of experience dealing with Windows – but most of that experience has been exasperating! Years of putting up with viruses, awkward user interfaces, instability, and the general hassles of Windows have left people with a bad taste in their mouths. Microsoft thinks that people’s familiarity with Windows means they are comfortable with it. On the contrary, most people want to run screaming from Windows! Where Microsoft thinks that continued sales of Windows means market acceptance, the reality is that for years people didn’t think they had a choice. So they put up with Windows and when time came to buy a new computer, they begrudgingly purchased another Windows PC. But now people are able to confidently choose non-Microsoft platforms and are increasingly doing so. The proof is in the pudding: Apple is the most valuable company in the world, having surpassed Microsoft as the most valuable tech company two years ago. Once people realized a clear alternative to a PC running Windows, they are switching in droves. Be careful how you treat people on your way up – there may not be anyone around to catch you on your way down. For years Microsoft was the bully in an abusive relationship. They pushed around their partners and they abused their end-users. It is well-known that Bill Gates had an extremely strong desire not just to be successful, but to crush and eliminate all competition. It was easily evident in their actions during the 1990’s. I remember telling people back then that Microsoft’s actions would come back to haunt them. You simply can’t treat people and companies as badly as they did and expect them to support you in the long run. Now it seems that my prediction is finally coming to fruition. Just like the bully that suddenly finds himself with no one on his side, Microsoft is about to find out that no one really cares if they fall. You’ve made your bed – now lie in it. There is really only one group of people who actually want Windows to succeed. Those who have a vested interest in Windows and Microsoft. That includes obviously Microsoft executives, employees, and stockholders. PC vendors also want to see Microsoft succeed. Those who make their living supporting Microsoft technologies such as corporate IT departments and Old World technology journalists also would like to see Microsoft continue their dominance. Suddenly, their job security is at risk as the world starts to shift away from the Microsoft dominated PC era to the New World of Technology. Many of these people wish that things would just go back to the way they were – where they were the decision makers and they could influence the technology people chose. They’ll do (and are doing) everything they can to convince people that Microsoft’s resurgence is right around the corner – just give them a little more time and they’ll be back in the driver’s seat. But Pandora’s box has been opened and there’s no closing it. People are now very familiar with a life away from Microsoft and there’s no way they’re going back to the one who abused them for so many years. Some of you may be thinking that my viewpoint is overly-simplistic. But I can tell you that a lifetime spent working with technology has taught me that many things in the tech industry are just that simple. It has also taught me that history repeats itself – as Bill Gates himself recognized. Microsoft and the PC industry were caught with their pants down. 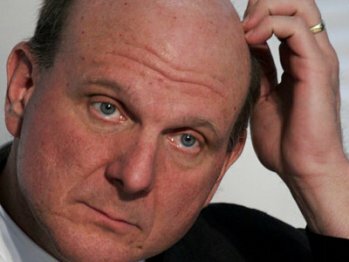 Now Microsoft wants to be a player in the New World, and are trying to position themselves as a technology innovator. However, Microsoft represents the Old World of Technology to many people. That Old World was not a happy place for the majority of tech users and they aren’t in a hurry to return to that way of life. This perception is ultimately Microsoft’s biggest problem and one that Microsoft may not be able to overcome.